Umethar : Talisman of the Anath - 2nd Annual Kit Rae Fantasy Knife Created to restore order to a world wrought with chaos , Umethar - Talisman of the Anath , has been forged from great powers. 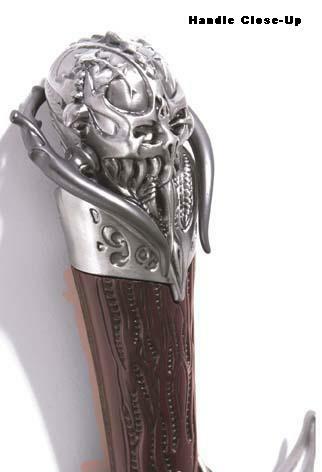 The hilt was carved from the bone of the Ancient One , first slain by mortal man; the pommel , fashioned in the image of Anath , fathers to the Ancients. Umethar holds within itself , dual powers of creation and destruction. The 2nd , in the Annual KR Fantasy Knife Series , is detailed with solid metal parts , a simulated bone grip and a mirror-polished blade. Each piece comes with a collector art print painted by designer , Kit Rae. This adult collectible is branded with the artist's distinctive trademark and includes a certificate of authenticity.